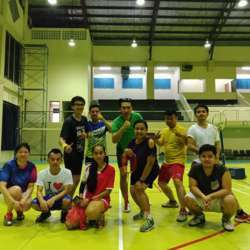 You must be a member of the Jakarta Badminton & Squash Group to attend this activity. Would you like to join this group? Are you in "Badminton Advanced Level" ???? ... IF yes ..let,s come and join us into " Monday Badminton Activity - only for Advanced Level ". You can get challenge partners in this activity( same levels - Advanced ) ...and it is only for advanced level...if you are Intermediate level or beginner ..please do not sign up...! 4. run always to chase the shuttlecock. 5. Good "Drop Shot" & "cross Court Drop"
6. Good "American Grip " & " Combination Grip".